We last reported on Nick Erven back in August 2016, shortly after he'd opened Erven, his eponymous vegan joint in Santa Monica. 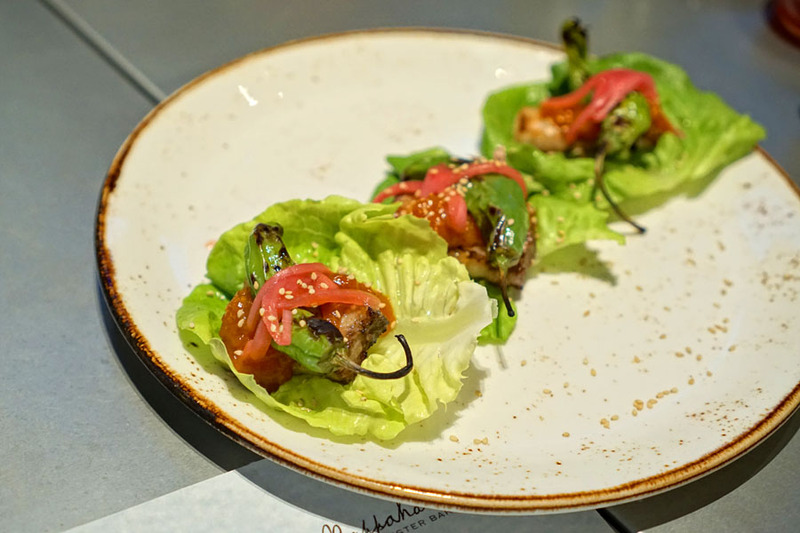 People really seemed to enjoy it, but the spot just couldn't survive, and ended up closing at the start of this year, not long after the Chef started consulting for The Venue in Koreatown. 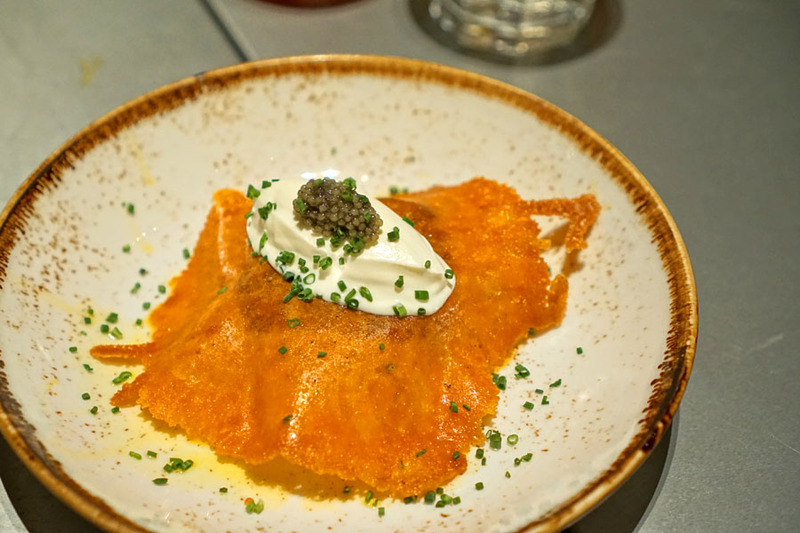 Following the shutter, it was announced that Erven would be leading the team at the upcoming Rappahannock Oyster Bar at ROW DTLA, and the restaurant eventually opened at the start of May for lunch, with dinner coming a month later. We recently paid the place a visit for a birthday celebration. A bit of history: Rappahannock actually traces its history back to 1899, when James Arthur Croxton Jr. (the current owners' great-grandfather) started an oyster business. He ran the company with son William Arthur Croxton Sr. until he passed away in 1961, while William himself passed in 1991. In 2001, cousins Ryan Croxton and Travis Croxton decided to revive the family business, and renewed their grandfather's oyster bed leases. Following, they began experimenting with oyster farming, and were able to starting selling product in 2005. The two were key in putting Virginia oysters on the culinary map, and in the process, they also helped revive and restore the Chesapeake Bay ecosystem. The Croxtons' next step was to get into the restaurant business. They teamed up with Scott Croxton (another cousin) and the three purchased a property near their oyster beds, which they turned into Merroir in 2011. 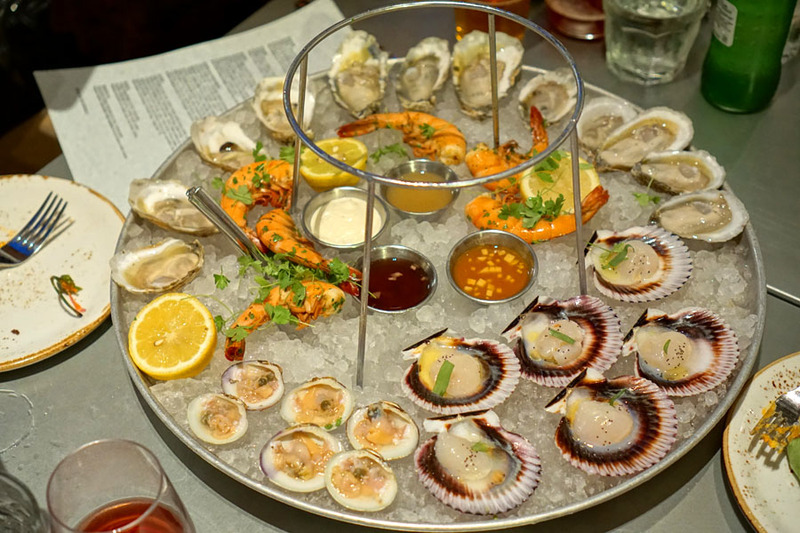 The "tasting room" was a success, and was followed up by the first Rappahannock Oyster Bar in DC's Union Market in September 2012. 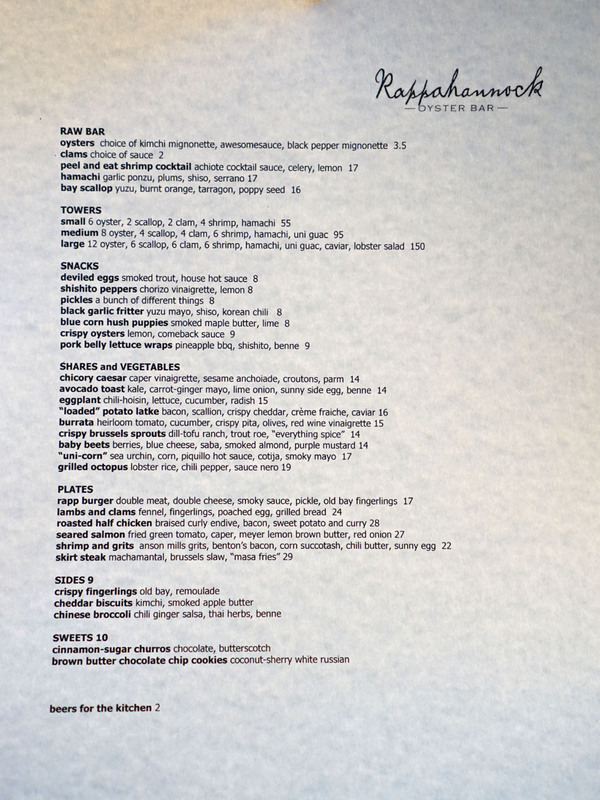 Rappahannock Restaurant in Richmond, VA arrived in December that year with Jonathan Staples--husband of Hilda Staples (Volt, Family Meal, Rogue 24, Graffiato, Aggio)--on board as a minority partner. 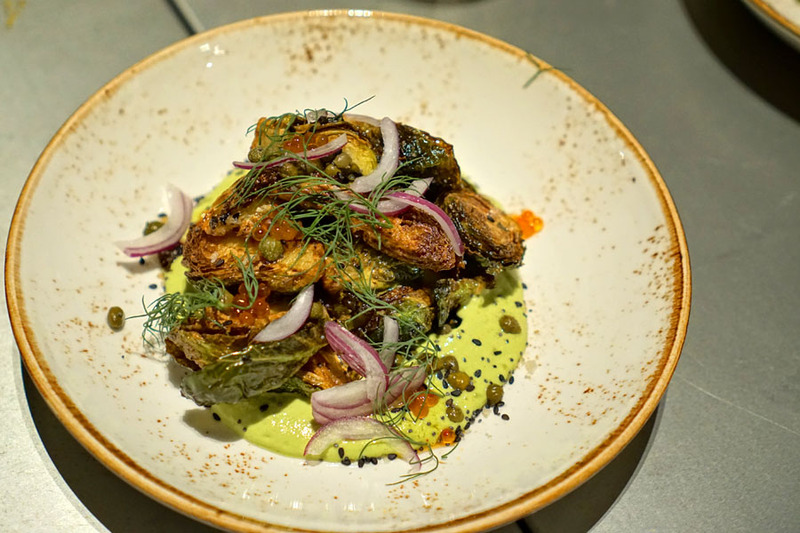 The adjacent Rapp Session opened in February 2016, while Charleston's Rappahannock Oyster Bar dropped in March 2017. There's another Oyster Bar in the works for DC's Wharf as well, slated to debut later this year. 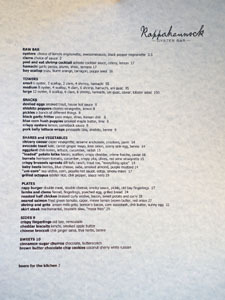 Travis has also expanded (sans cousins) into non-Rappahannock restaurants, collaborating with Derek Brown in 2013 on Eat the Rich (and oyster-slash-cocktail bar) and Southern Efficiency (a whiskey bar) in DC's Shaw district. He also got a piece of Graffito's (now-closed) Richmond expansion and opened two Rocksalts: one in Charlottesville, VA in September 2014 and one in Charlotte, NC in February 2015. Also in his portfolio is GWARbar in Richmond, VA (January 2015) and Brine in Fairfax, VA (May 2015). Rappahannock DTLA was penned by Studio Unltd (Bavel, Dominique Ansel, The Rose Cafe, Otium, Chianina, MessHall, Bestia), and shows off a contemporary maritime sort of aesthetic. The open kitchen and concomitant Carrara marble dining counter dominate the room, and there's considerable patio square footage out front as well. Erven was given free rein on the menu, and as a result, the food turned out much more interesting than I was anticipating. 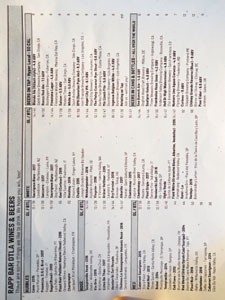 Beverage-wise, we have a compact wine list and a decent array of beers too. 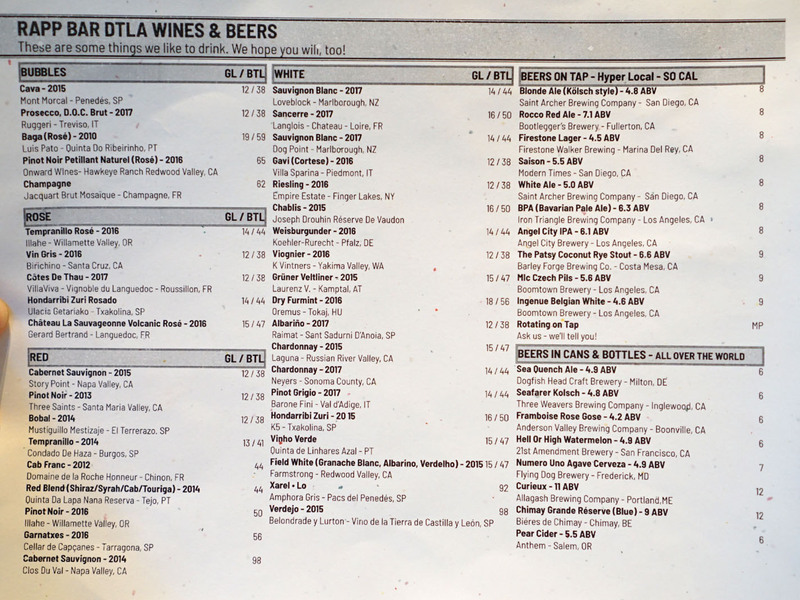 Corkage is $25, and we were charged twice. Click for larger versions. The name "uni-corn" is utterly obvious now that I think about it, so I'm surprised that this was the first time seeing it on a menu. 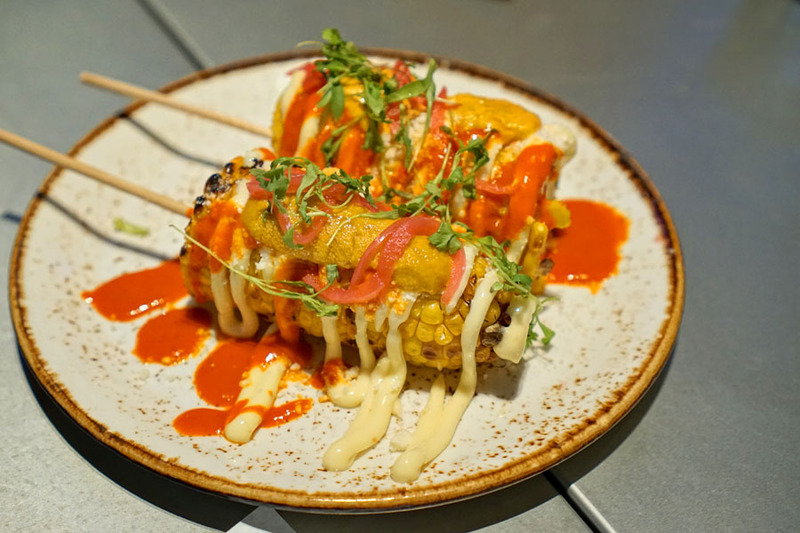 Moniker aside, the elote-esque dish worked things out, presenting a mash-up of corn and urchin sweetness with an omnipresent, lingering smoke and a touch of heat. We ended up getting comped a couple dishes (birthday boy was a regular at Saint Martha), and the first was this ssam-like preparation of pork belly. I certainly didn't mind it, finding the heavy, hearty flavors of the meat surprisingly well-matched to the sweet-tangy BBQ sauce while the veggies provided the needed contrast. The complimentary hushpuppies turned out to be some of the best I've had. They highlighted the actual corn really well, and worked beautifully with the sweetness of the paired butter. I appreciated the acidity provided by the pickled onions, too. Being the egg fiend that I am, this was a must-try for me. 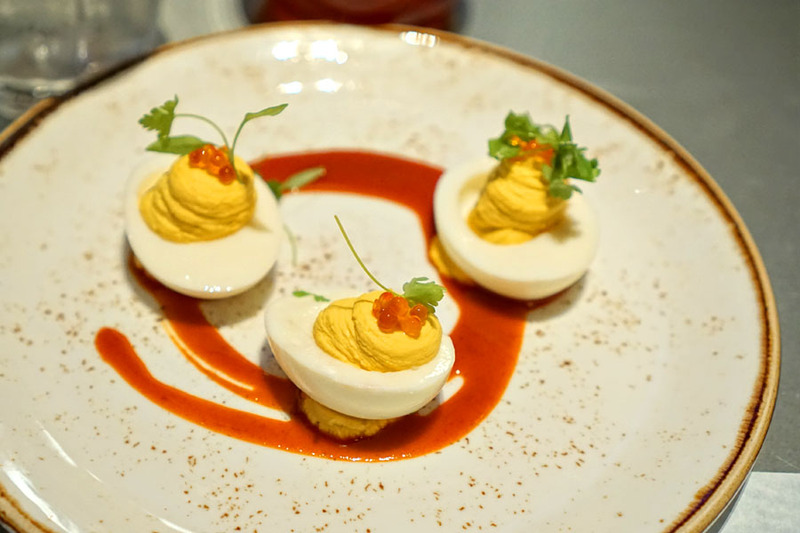 The eggs were on point texturally, and the yolk matched like clockwork with the smokiness from the trout roe. I would've liked more heat from the advertised hot sauce, however. 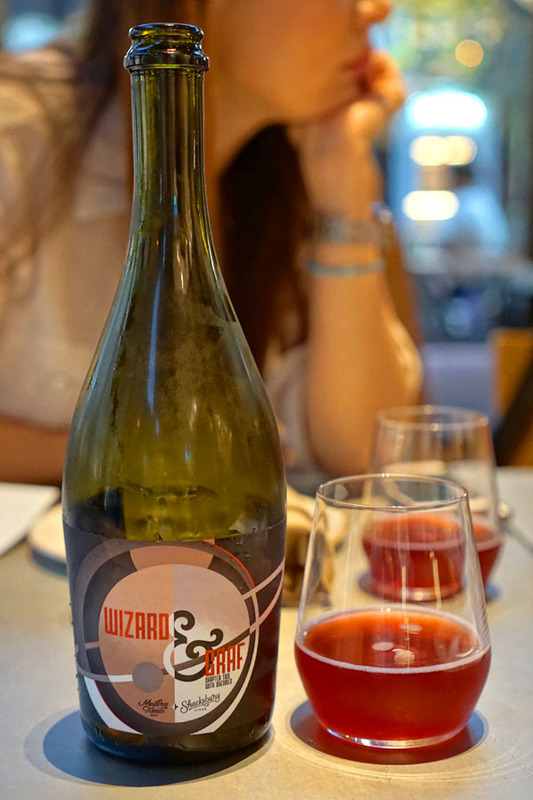 Our first beverage was the 2018 Modern Times Wizard & Graf: Chapter 2 with Cherries, a saison-apple cider hybrid aged in both clay amphoras and French oak with Montmorency and Balaton cherries, created in collaboration with Shacksbury Cider out of Vermont. Its nose was barnyard-y and sour, but with a distinct cherry note. Taste-wise, I got more tartness and funk commingled with a soft acidity, minerality, and a sweet cherried spice on the mid-palate. Rappahannock River Oysters - These were among the easiest-eating oysters I've had: soft, sweet, mild, with surprisingly little salt. Rochambeau Oysters - I didn't get to try these, but from what I heard, they were clean and subtly briny, and went down pretty easy as well. Olde Salts Oysters - I found these creamy at first, but this quickly transitioned to a strong, focused salinity that really stayed with me. Peruvian Bay Scallops - With tarragon, poppy seed, yuzu juice, and burnt orange oil. Again, I wasn't able to try one due to the number of people we had in our party. Clams - Super clean, with a sharp, oceany taste. Shrimp - Fresh tasting for sure, but also just briny enough, with a citrusy tartness and an herbaceous, astringent character. Accoutrements, meanwhile, included horseradish cream, maple-black pepper mignonette, kimchi mignonette, and "awesome sauce" (a Vietnamese-style ceviche sauce if I'm not mistaken). Hamachi, Sliced Plums, Watermelon Radishes, Serranos, Garlic Ponzu, Shiso - I got a nice depth from the soy here, along with a persistent heat on the finish thanks to those serranos. The other elements contributed a bevy of contrasting tart, tangy notes that I appreciated as well. Caviar, Crema, Toast - I was a fan of how in-your-face salty the caviar was, and how that was tempered by the lushness of the cream and the bit of toast on the bottom. Uni Guacamole with Masa Fries - Fries were crispy and wonderfully corn-forward, and went swimmingly with that zippy guac. Lobster Salad - Typically found in the lobster roll at lunch, this was delightfully sweet, creamy, and clean. crispy brussels sprouts [$14.00] | dill-tofu ranch, trout roe, "everything spice"
The Brussels delivered, no doubt. All the smoke and char and crunch and bitterness that I wanted was there in spades, evened out by that "ranch" while the red onions provided a welcomed sharpness to things. I had to get the octo of course, which I did not regret. It was super savory, but also super tender, with a lovely hit of citrus that served as a great accent piece. The lobster rice was unexpected, but worked as a rich, creamy, cozy complement. 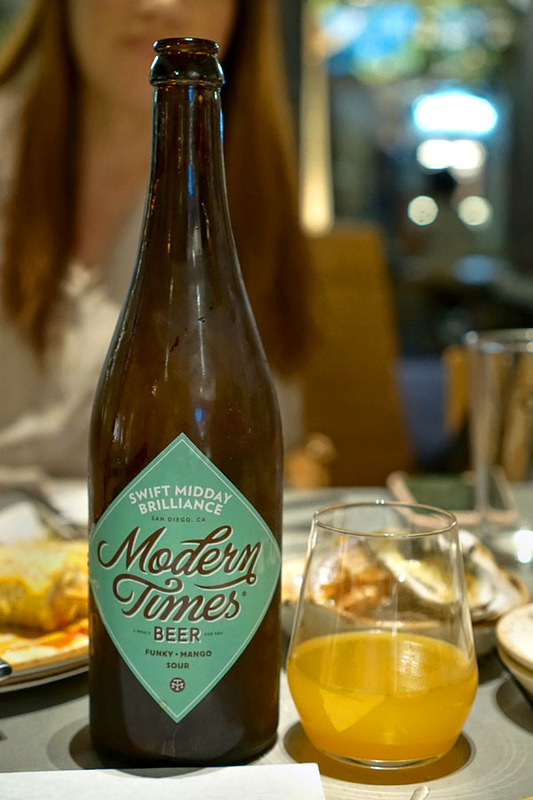 Our next beer was the 2017 Modern Times Swift Midday Brilliance, a sour blonde-sour saison blend, fermented with Saccharo/Brett/Lacto, then aged in white wine barrels with mangoes. It smelled tart and Bretty for sure, but with the sweetness of the fruit peeking through. On the palate I found sourness and acidity initially, along with rich, true-to-life mango flavors coming through toward the back end. Here was a mash-up of a latke and Waffle House hash browns, a wondrous mélange of potato, pork, cheese, cream, and salt that I found utterly gratifying. A favorite of mine. 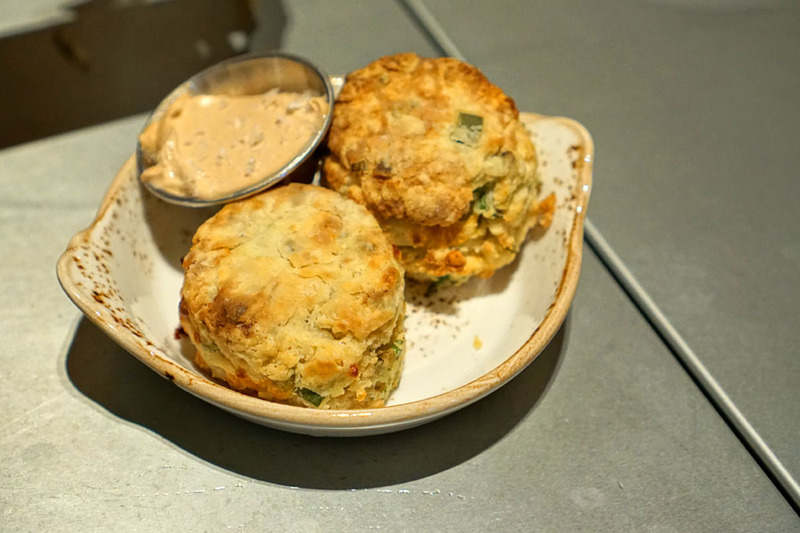 Erven's biscuits were ostensibly inspired by Red Lobster's Cheddar Bay examples. They were soft yet crispy, and buttery certainly, and had a flavor profile that reminded me of Chinese cong you bing, which I loved. Delish alone, but even better with a dab of that sweet 'n' smoky butter on the side. This panzanella-ish salad was a pleasant surprise. 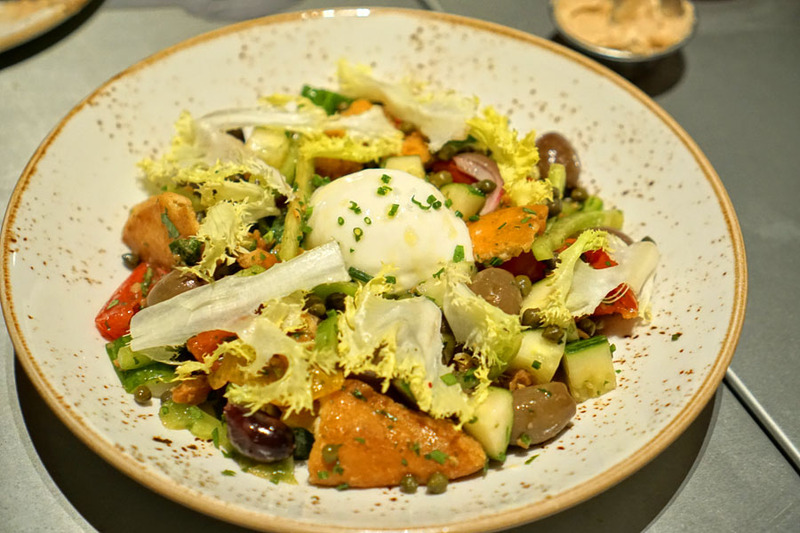 The burrata was as cool and creamy as you'd expect, and really worked as a foil to the potency of the olives. The veggies provided further contrast to the dish, and I was a big fan of those crunchy shards of pita, too. 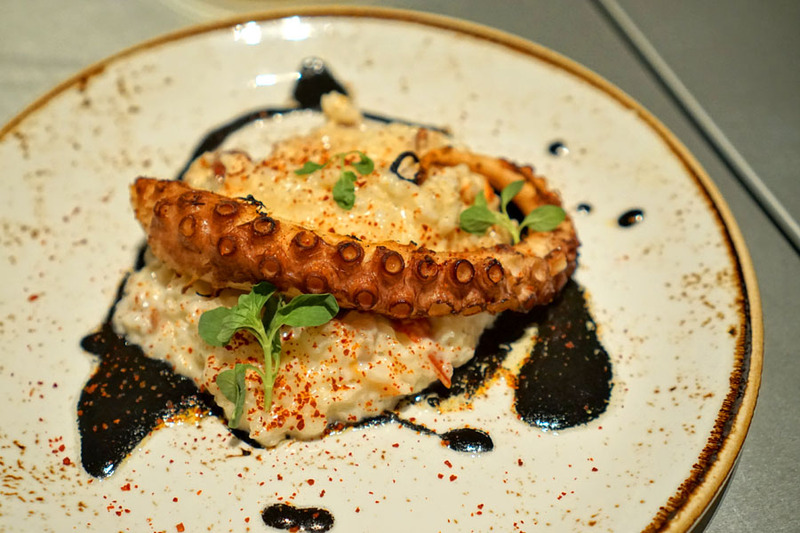 Erven's take on a Rappahannock staple was a monochromatic affair, but fortunately it tasted better than it looked. 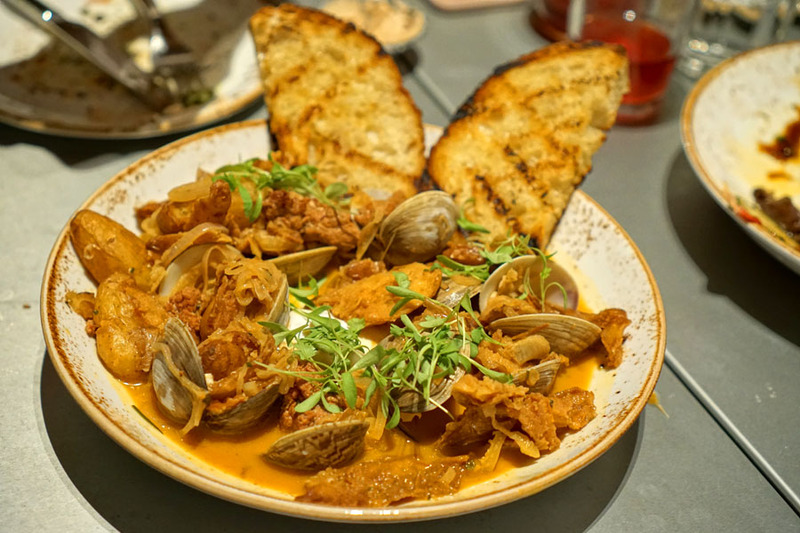 The crux was the balancing act between the brine of the clams and the savory depth of the lamb, with the potato serving as a moderating element. The fennel, meanwhile, added a welcomed zinginess to the dish. 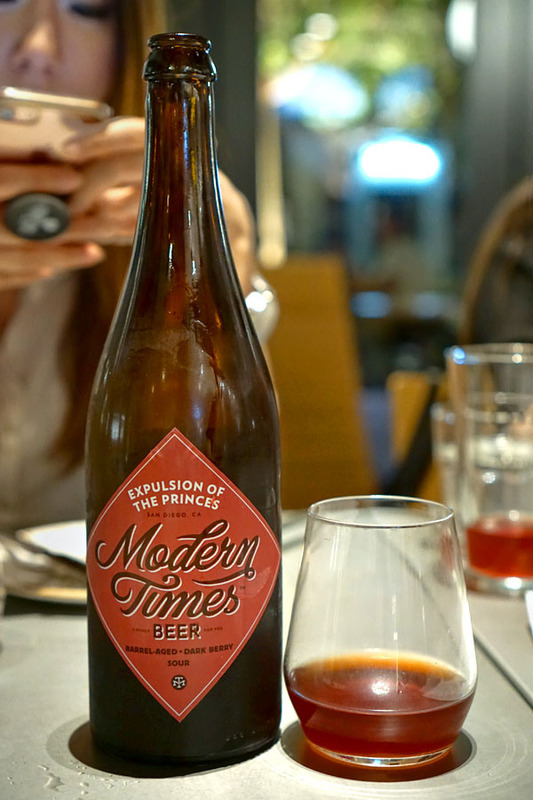 The evening's final beverage was the 2017 Modern Times Expulsion of the Princes, a blended, red wine barrel-aged, Lacto/Pedio/Brett-fermented dark sour ale with blueberries and blackberries. Aromas were on the vinous side, with dark berry fruit, leather, and light grain. In terms of taste, I got more of that rich, jammy berry alongside light smoke, light acidity, and a crisp-drying character. Here was the most overtly Asian-y dish of the night. 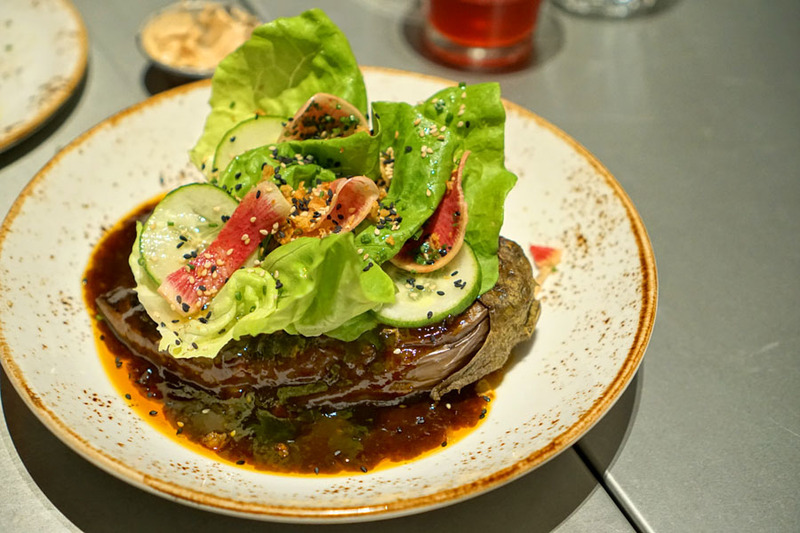 We had what seemed like an entire eggplant, a meaty, satisfying specimen doused with the familiar, dark-toned savoriness of hoisin. It was some pretty heady stuff, so the veggies on top were crucial as a counterweight. Last up was the Chef's version of a Lowcountry classic. 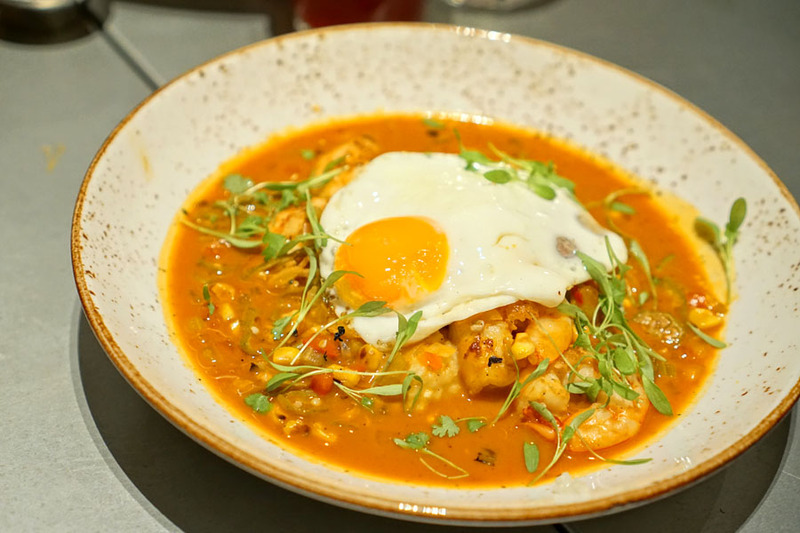 It was a homey, comforting dish, the well-spiced grits meshing well with the sweetness of corn and the considerable brine of the shrimp (which, I will say, were a touch over). 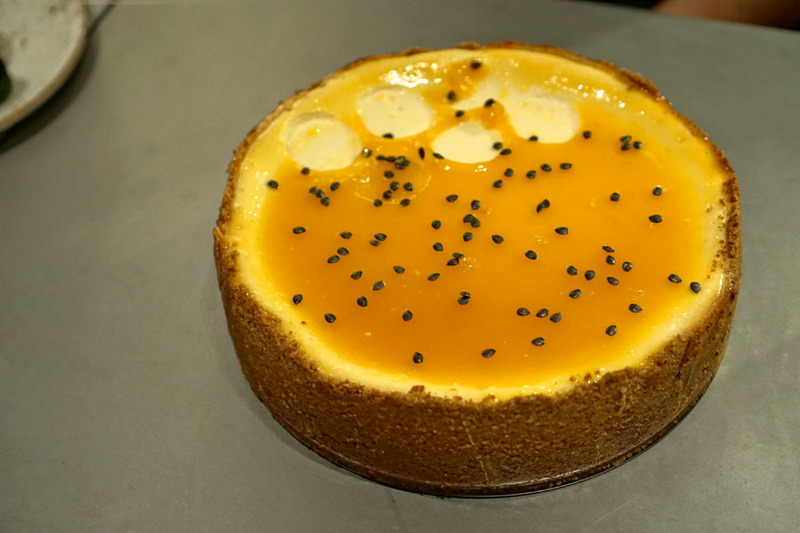 Since this was a birthday dinner, one of my dining companions ended up preparing a coconut cheesecake with passion fruit. 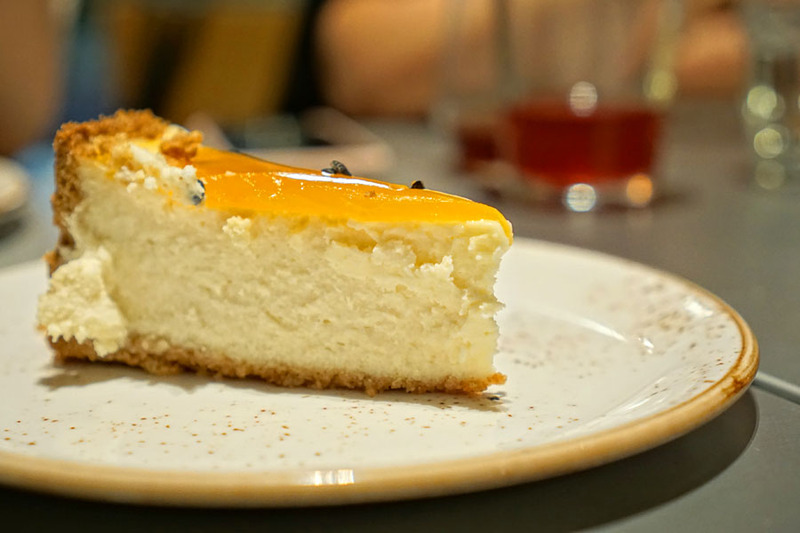 It was actually one of the best cheesecakes I've had in a while. I found it relatively airy, with a good back-and-forth between sweet and tart, while the crumbly crust was thoroughly enjoyable. The key, though, was the subtlety and finesse of the coconut, which served as the perfect accent to the classically rich, creamy nature of the cake. Note that the circular depressions on the surface of the cake were due to non-edible, succulent-themed decorations that were removed. Given my preconceived notions of Rappahannock, I was expecting some fairly prototypical East Coast seafood from this place. However, I should have known better with Erven in command of the kitchen. 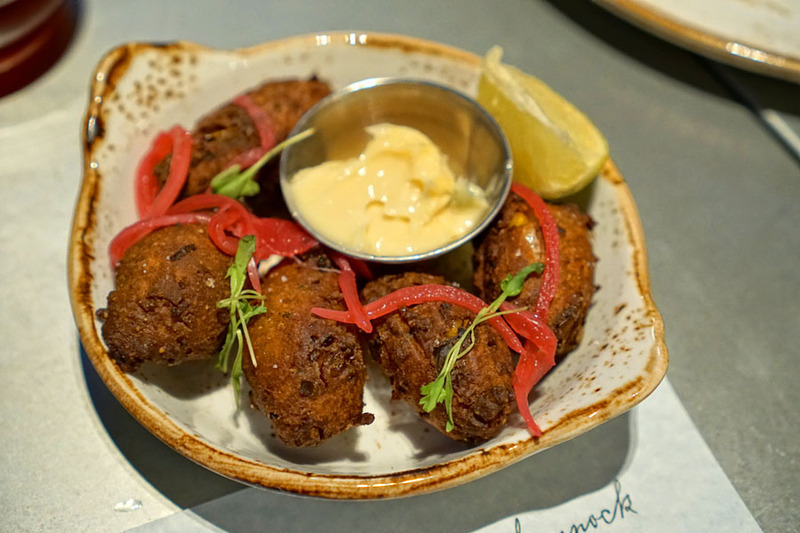 Even though Rappahannock's sort of a chain restaurant, the place felt distinct, unique, "LA" if you will. 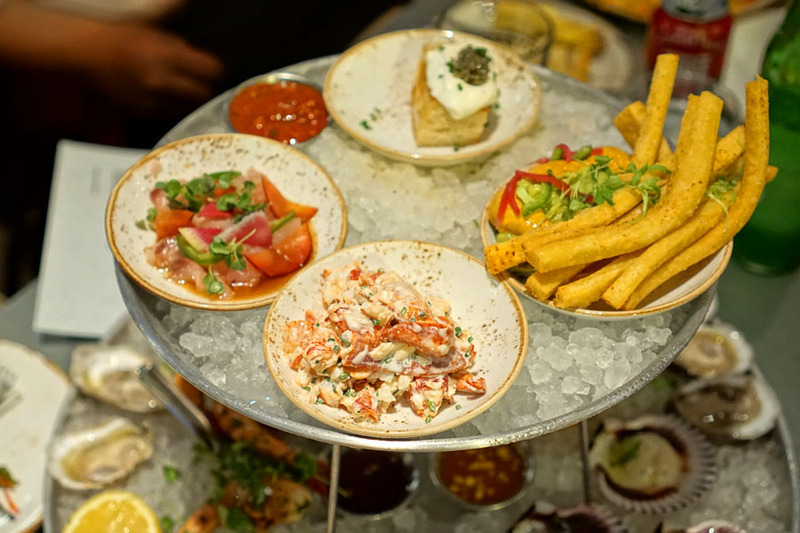 Certainly, the food is centered on the classics, with a lot of Southern influence to be sure, but you'll also find plenty of contemporary details and multicultural leanings that touch upon the diversity of Los Angeles. This was my first meal at the new ROW development, and it's a promising start. that's a pretty sad looking seafood tower, especially for the price. and you can't even blame the neighborhood for the tariff, you get more at the Water Grill! Ah perhaps. I have to say that I pretty much never order seafood towers, so I guess I don't have much of a point of reference.